I’ve got for you two fantastic reasons to celebrate today: first, it’s FriYAY! Second, it’s National Vegetarian Week! To celebrate, I thought it would be fun to share a vegetarian twist on a classic breakfast staple: eggs+bacon. 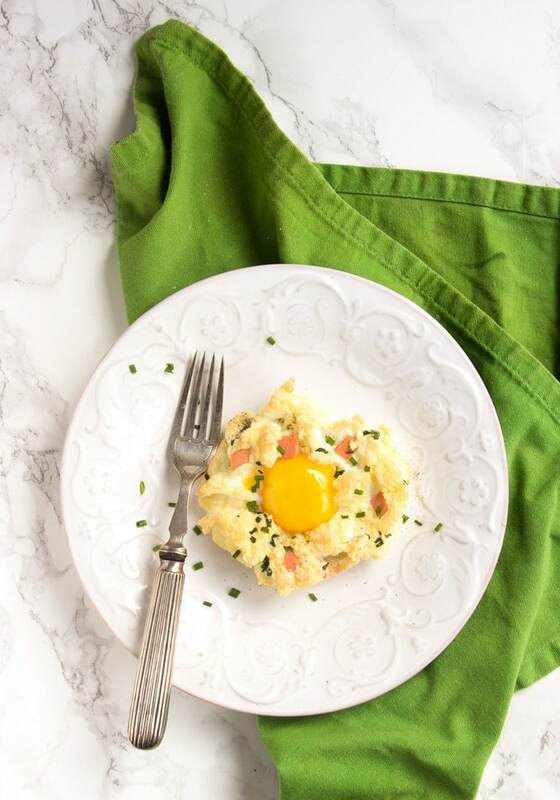 Have you ever tried eggs in a cloud (or cloudy eggs)? They have become HUGELY popular lately, and I’m so excited to finally share this recipe with you. Eggs in a Cloud might be a little hipster, but from all the fancy ways to cook eggs, this is most definitely the easiest one (besides perhaps Italian mini frittatas). Packed with simple but amazing flavors, requiring little effort and ZERO cooking experience, these Eggs in a Cloud are ready in just 15 min of your time, and all you need is 4 simple ingredients: free-range eggs, chives, and Quorn™ vegetarian bacon. For this awesome recipe, I’ve partnered up with Quorn, one of the most established and reliable brands for all the vegetarians out there. 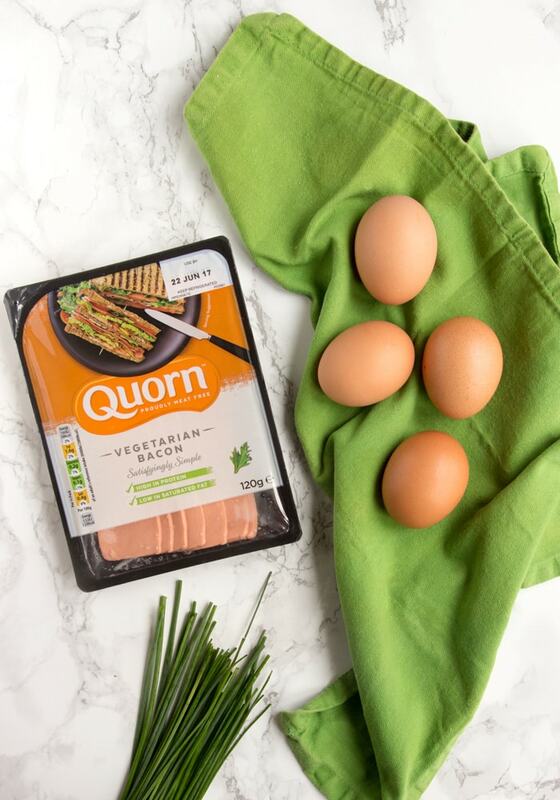 Have you ever tried Quorn bacon rashers? They’re flavorful thin stripes of vegetarian awesomeness, deliciously smoky and high in protein, a perfect meat-free alternative for a tasty breakfast. 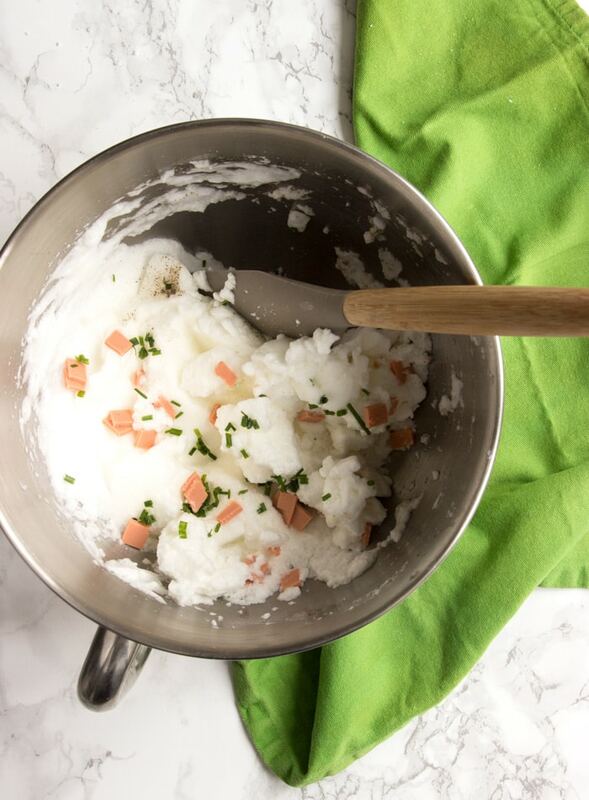 Back to the recipe, once you have gathered all your 4 ingredients, these Eggs in a Cloud are ridiculously easy to make. All you have to do is whipping up the egg whites and arrange them like little fluffy clouds on a baking tray. Bake for a few minutes, then add the yolks on top and bake for a few extra minutes. Et-voila! 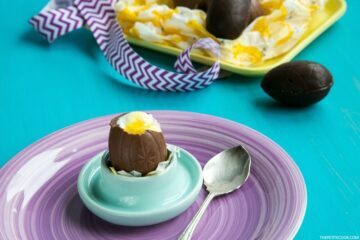 Before you know it, your fancy-looking eggs are all ready to WOW you and the rest of the family. 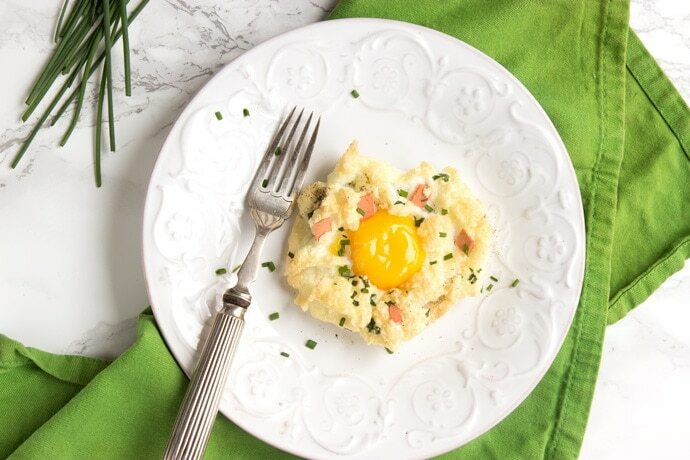 These fluffy and light Eggs In a Cloud make an impressive, yet simple, breakfast/brunch/light lunch in less than 15 minutes - Plus, they're loaded with protein and are naturally gluten-free and meat-free! Preheat oven to 220C / 450F, and line a baking tray with parchment paper. Carefully separate the egg whites from the yolk, making sure not to break the yolks. 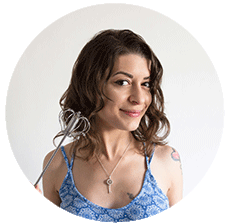 Add the egg whites and a pinch of salt in a stand mixer with a whisk attachment, and whisk the egg whites until stiff peaks form. Gently mix in the chives and bacon bits. 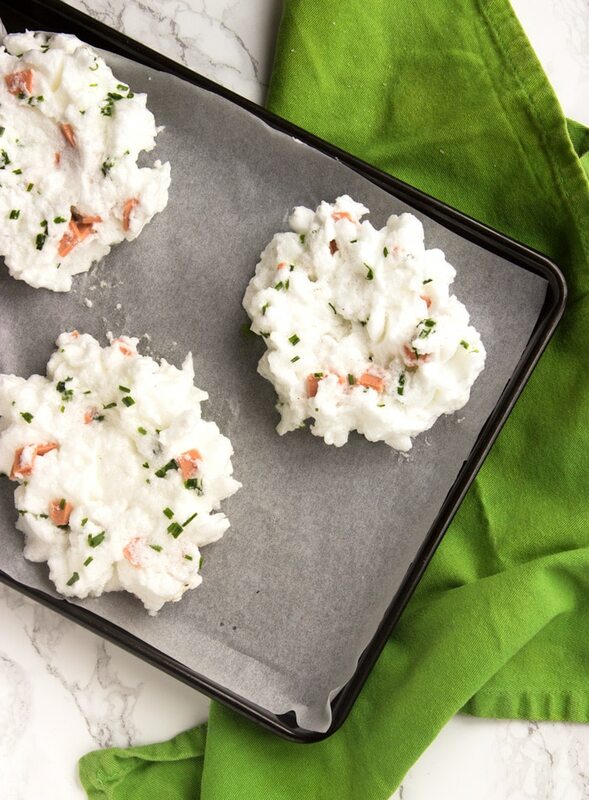 Spoon the egg whites mixture into even little clouds over your prepared baking tray. Arrange the baking tray in the middle rack of your oven, and bake the egg whites for 3 minutes. Gently place 1 egg yolk on top of each cloud, and bake for a further 3 minutes. Remove from the oven and serve immediately, with freshly cracked black pepper on top. This does look like a pretty dish. I would be worried about trying to get the egg whites right to stick the egg yolks in, but it does look good. This looks heavenly! I bet my daughter would enjoy eggs in a cloud, as well! Seems like a perfect go-to breakfast option! Andrea, these look yum. I have never heard of vegetarian bacon! These are so cute! And sometimes it’s great for meat-eaters to take a break and try an alternative. Looks delicious, but I am wondering if I can replace the vegetarian bacon with actual bacon. I don’t use eggs much, but I’m a vegetarian. I will try this one. Thank you for the recipe. I’ve never heard of vegetarian bacon but it looks incredibly delicious! Can’t wait to try! I love meatless crumbles so I’ll definitely try this out! I’m always looking for nonmeat substitutions for a healthier lifestyle. This looks so delicious. My first time learning about the vegetarian bacon. I always see the vegan brand. This is the first time I read about cloudy eggs. I will give it a try with the recipe you shared. Oo this looks so delicious! I’ve never tried vegetarian bacon before, but I certainly would. This looks absolutely amazing. I’m a vegetarian and find it so hard to find new foods and recipes. It is a must try for me thanks for the recommendation. Really liking the idea to mix flavour ingredients into the egg white cloud, changes it up a lot from the repetitions all over the web. I’m thinking your version totally wins!! 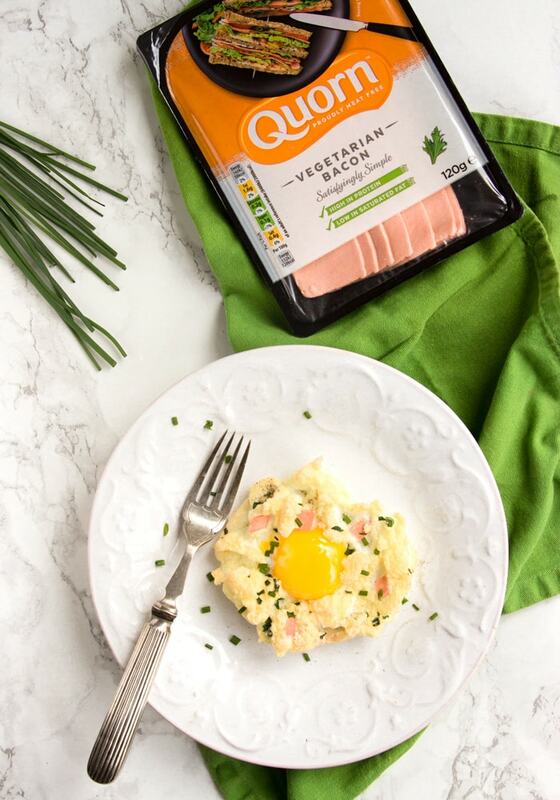 Those cloud eggs look delicious and I love quorn products, not tried the bacon yet, but will look out for it now. I would love to try eggs in a cloud. Never heard about this recepie before and I would love to try this meat substitute. These are so cool! I’ve never seen eggs done this way, but you made it look so simple! As a person who loves making vegetarian meals, I’m intrigued by vegetarian bacon. 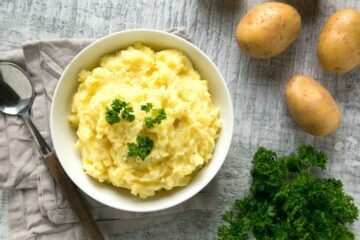 This recipe looks really delicious, i wouldn’t mind trying it! These look amazing! I like vegetarian dishes even though I’m not a vegetarian. Added to my recipe book! What a great and fun breakfast. I’ve never had eggs in a cloud but I have to rectify that real soon. I’ve never heard of Quorn! I’ll have to try it out. I haven’t tried Eggs in a Cloud yet, but have seen it around. Your version looks incredible! I love the addition of the vegetarian bacon. 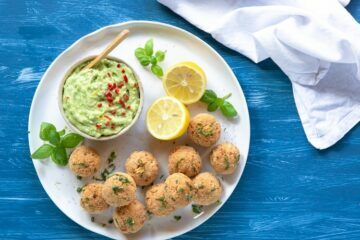 Perfect for Vegetarian Week! Oh man!!! This looks incredible! I’m not a vegetarian, but I often find that vegetarian substitutes are just as good or better than meat. I am going to have to try this over the weekend.